From the brands that color the industry to firms outside of real estate, each year, acclaimed business leaders offer their perspectives at RISMedia’s Real Estate CEO Exchange. Whether it’s Paul Charron, chairman of the board of The Campbell’s Soup Company—whose above advice was given at the 2015 CEO Exchange—Dave Liniger, founder of RE/MAX, or John Peyton, chief executive officer of Realogy Franchise Group, attendees of the CEO Exchange are exclusively party to these powerful takeaways, and the people behind them. 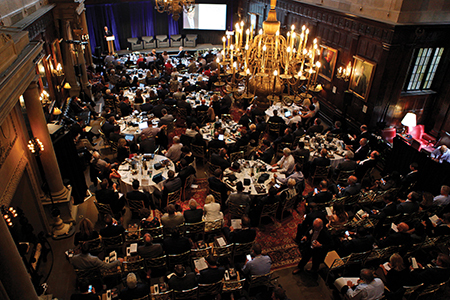 At the 2018 CEO Exchange, “Ready, Set, Now: The New Real Estate Reality,” more than 225 brokers and executives will gather at the Harvard Club of New York City for not one, but three sessions, with Dermot Buffini, chief executive officer of Buffini & Company; Helen Hanna Casey, chief executive officer of Howard Hanna Real Estate Services; and Bob Goldberg, chief executive officer of the National Association of REALTORS® (NAR). On September 5, Buffini, along with John Featherston, chief executive officer and president of RISMedia, will explore the hurdles on the path to real estate success, and how to overcome them. Later on September 5, Casey and Featherston will meet one-on-one to discuss the industry, with firsthand insight from the leader of the No. 3 brokerage for transactions in the U.S.
On September 6, Featherston and Goldberg will candidly discuss NAR’s obstacles and progress thus far, and the organization’s priorities for the upcoming year. Over the course of the day-and-a-half event, Buffini, Casey and Goldberg will be joined by many other speakers, including Jessica Edgerton, executive vice president of Operations, Leading Real Estate Companies of the World®; Jennifer Lind, vice president of Business Strategy, John L. Scott Real Estate; and Diane Ramirez, chairman and chief executive officer, Halstead, who will share their strategies for success. RISMedia’s Real Estate CEO Exchange is by exclusive invitation only. Contact Cindi Gallucci, cgallucci@rismedia.com, for information.